Last night, I did end up doing Wii Fit before heading to bed. I hadn’t done it in ages and two good things came from not doing it for a while–the program told me I lost weight and that I was amazingly balanced! I think my time at the gym has definitely paid off. I am more excited about the being balanced news than anything else. Last year, I dealt with spraining my right ankle and finding out my left ankle had a small break in it. I felt off balance all year, even with physical therapy. From going to the YMCA regularly and strength training more, I have gained strength in my legs and core and it has helped tremendously. Doing some yoga, balance exercises and a little boxing on the Wii seemed to have help my stomach, because I felt better this morning. 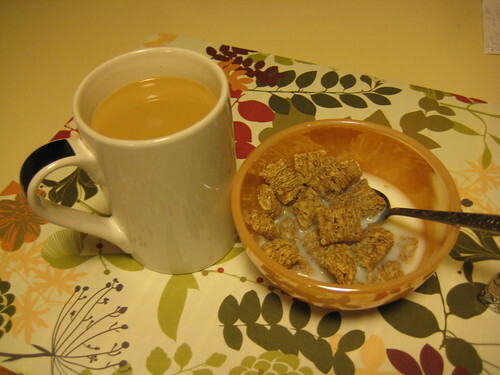 My first meal of the day was Kashi Autumn Wheat and coffee. Snack was a small piece of Danish and coffee. 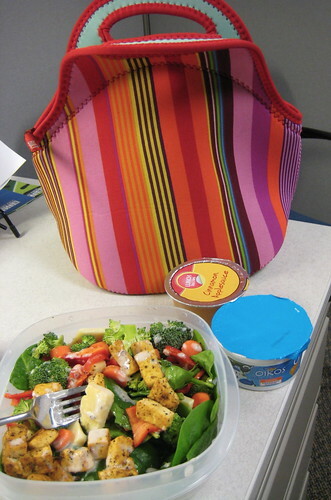 Lunch was spinach salad with baby carrots, tofu, red sweet pepper, a tiny bit of Greek style feta dressing and Irish cheddar to add a nice kick to the meal. I also had an applesauce and Stonyfield Oikos honey yogurt. 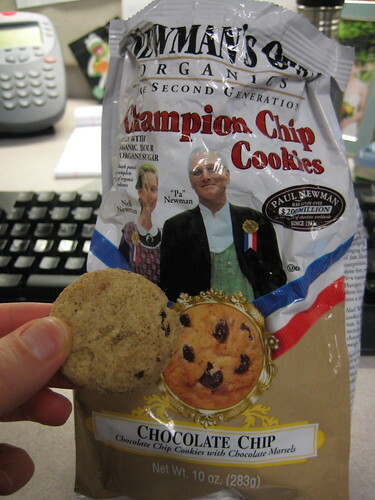 Dessert was Newman’s Own chocolate chip cookies. The cookies are so addictive! I had to put them down and tell myself to stop at one point! 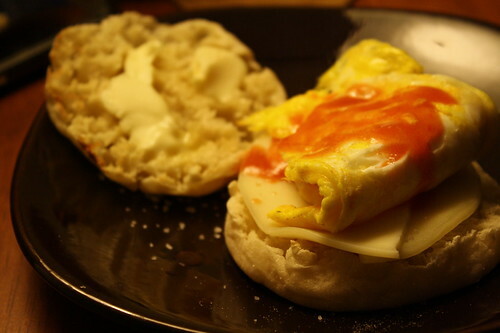 I didn’t know what to make for dinner, so I settled on having a fried egg sandwich with provolone cheese on an english muffin. It hit the spot! 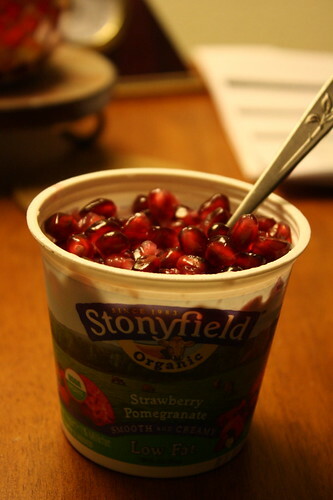 After work, I opened up a pomegranate and got the arils out, so I topped a Strawberry Pomegranate Stonyfield yogurt with arils. I went to my Thursday night yoga class and we had a substitute teacher. We started class with Tai Chi, transitioned to more flow yoga and then did some traditional poses and abs. I was proud of myself–my core is the weakest part of my body and I stuck with staying strong on all of the tough ab exercises and felt the burn. It was a good class, but I really missed our regular teacher. 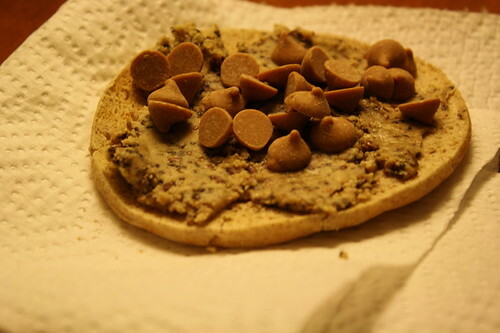 After class, I snacked on an Arnold’s Thin with NuttZo Peanut Free and some all natural pb chips. Glad tomorrow is Friday, even if my weekend is cut short because I have to work a half day on Sunday! Hope you had a good Thursday.